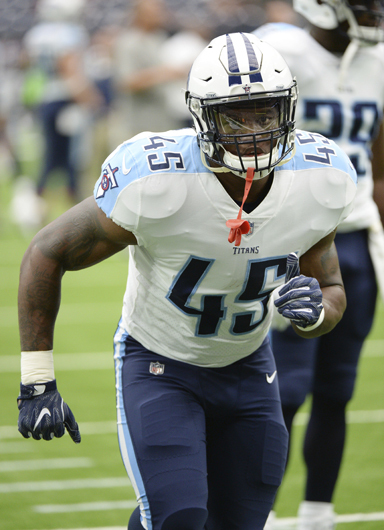 Tennessee Titans fullback Jalston Fowler has been with the Seahawks and the Falcons since being released by the Titans in 2015. Jalston Fowler knows he is an endangered species, a dinosaur, an eight-track tape, a Pontiac. As a player trying to make his living as a fullback, Fowler’s position has nearly been phased out completely in today’s game of three-receiver sets and wide-open offenses. Fowler was let go last year as the Titans were heading toward a playoff berth, a bit of a surprise move because a team that prided itself on “exotic smashmouth” would seem to be a rare perfect fit for a player whose job is to be a lead blocker and open holes for tailbacks. But the Titans waived Fowler, a fourth-round pick in 2015, last year, five days after signing blocking tight end Luke Stocker. Thus began the football odyssey that brought Fowler full back to Tennessee last week. He was on the inactive list for Monday night’s win at Dallas. Fowler admits he could have returned to the Titans’ practice squad shortly after being let go and clearing waivers but decided that maybe a fresh start elsewhere would be better. The Emerald City quickly lost its luster as Fowler was released in training camp. He found himself back in the South a few days later with the Atlanta Falcons. But that too would be a short stay for the former Alabama standout. He spent only a few days as a Falcon before being let go in the team’s roster cuts. “It’s been crazy,” he recalls. “I’ve been to Seattle. It worked out good there, but I had a couple of problems with hamstrings (in camp). Then I went to Atlanta, and it was cool down there. I knew a couple of guys like Julio (Jones) and Calvin (Ridley). Ah, back at home. Fowler now comes back to the Titans, his NFL home for the first three seasons of his professional career, and finds himself not only in a familiar locker room but maybe in a familiar role – opening holes for former Alabama and Titans teammate Derrick Henry who, by his own admission, has struggled in 2018. In a spruced-up offensive system that was supposed to maximize quarterback Marcus Mariota’s skills and put him in position to make plays, it would seem that adding a fullback would run counter to that type of scheme. So there is a certain irony to Fowler’s return now that the Titans’ grand plans to open up the offense have fizzled with half a season ahead. Fowler says he likes the new system and believes he can find a niche. “It’s very appealing because I feel like now it’s very simple,” he says. “It’s more like blocking a spot than a guy. It’s something like they ran in Atlanta, so it’s very easy to pick up. Certainly Henry, who is letting Fowler live with him in his house as he settles back into Nashville, is glad to have Fowler back. “It’s good to have him around. We’re like brothers, and I know that when he’s in there he’s going to do a good job,” Henry says. “He’s been doing that since we were at Bama. And while Fowler’s return has brightened Henry’s outlook and could possibly jump start his play, the fullback’s return didn’t come off without a hitch. There was the little issue with Henry’s Rottweiler, Nino.